I'd like to show you INTO THE BLUE, a new homebrew game for the Game Boy I released a few days ago. The goal of my project was to create a game that looks and feels like a commercial game from back in the day. The result is a puzzle game that plays similar to Tetris Attack. It's free, so please check it out on my website https://the-green-screen.com! I hope that my post is welcome in this forum. I tried to contact an administrator to ask for permission but didn't receive a reply. So please accept my apologies if it should be against the forum rules. Yes your post is welcome! Congrats on making the game. You will find many “Game Boy-themed” games on the internet, but most of them actually are PC games that only look like Game Boy games. In contrast, the games from this website work on the real Game Boy hardware. 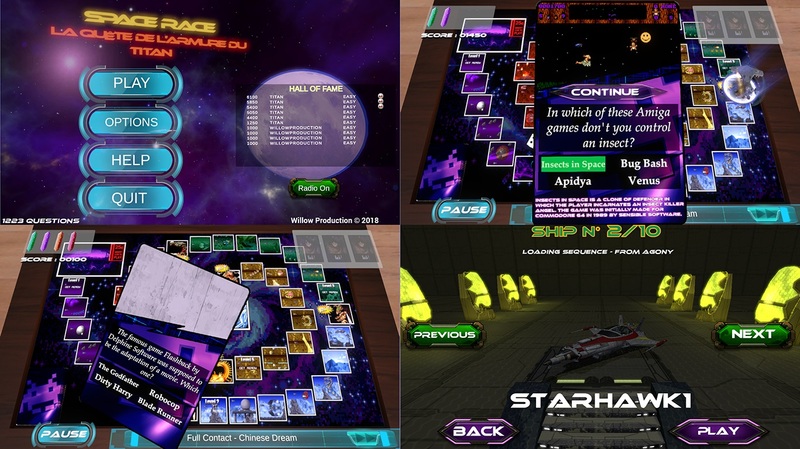 They were not created with the help of any of the tools that make game design easy nowadays. From the earliest beginnings of micro-computing to the advent of PlayStation, do you really think you know everything about retro video games? Now available in English, it is finally here! It is handsome, it is tall ... and it is TOTALLY FREE! 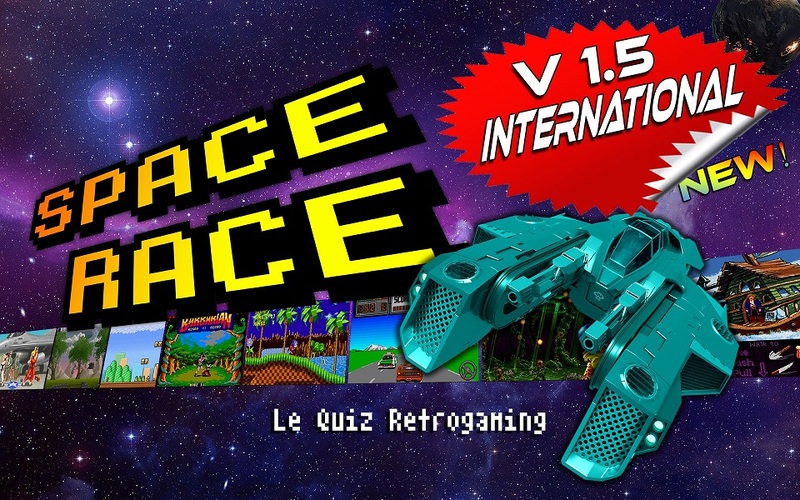 More than 1200 questions with anecdotes, a graphic chart borrowed from the world of old video games and our dear 80s: halfway between the Trivial Pursuit and the game of the Goose, "SPACE RACE " is a quiz-type board game, exclusively dedicated to retrogaming, which aims to revive memories as well as nostalgia through the galactic adventures of an unrestrained race in the cosmos. Share, diffuse, peddle, dispense and spread the information by any means! Eric Cubizolle (TITAN from http://amigamuseum.emu-france.info), Hakim Louati (Willow) and Olivier Brunel. First of all... I hope this isn't in the wrong forum, or against forum rules, as self-promotion or similar. I'm trying to spread the word to find out how much interest there is in something like this, and this seems like as good a place as any to find like-minded people who might enjoy N64 gaming on the Wii Virtual Console! A little introduction... so I love the Wii Virtual Console, especially for playing Nintendo 64 games. The emulation is always surprisingly true to the original, and in my opinion is a great way to play old games, without needing a barrage of consoles plugged into your TV. The only thing I missed about the Nintendo 64, was the inability to play using an original N64 controller. So, I bought a N64 to GC adapter... and was disappointed. The buttons all worked as expected, but the analogue stick felt all wrong. After doing some research, I found that in order to ensure you have full analogue stick range with a GameCube controller... Nintendo made the Virtual Console re-map all the stick values... making a simple N64 to GC controller adapter not work properly for any Wii Virtual Console releases! Interestingly, this is also the case for the Ocarina of Time re-release for the GameCube (Ocarina of Time and Master Quest). Being an electronics enthusiast, I decided to create my own adapter, which does everything that the N64 to GC adapter does... but is also able re-map the analogue stick appropriately for every Wii Virtual Console title in real-time. After a few weeks of logging the exact mappings performed by every Wii VC title, calculating an inverse mapping for each game, and a little VHDL programming... I finally had an adapter that makes N64 Wii VC releases feel exactly like the real thing again! After many hours of using this adapter, and being completely satisfied that it works flawlessly... I decided to test the waters to see if anyone else, who isn't able to make one for themself, would be interested in buying such a device. For that reason, I've created a small kickstarter, to see if a minimum of 20 people would like one, before I waste any money ordering more parts. There are pictures and a video to demonstrate the adapter working correctly, including surface plots of the mappings performed by the Wii Virtual Console, and the fixed mapping after using the adapter. I thought it was interesting to look at at the very least! If you have any questions or queries, I'd be happy to answer! Really cool and kudos for making it. I have seen similar adapters for the Wii to use snes controllers, but I was put off from purchasing because they had input lag. If you really want to promote this may I suggest you contact Bob from RGB retro. This is his kind of field and I'm sure he would be interested in talking or even reviewing it on his weekly youtube round-up video. Thanks for letting me know about RGB retro... I'll consider sending him a PM, I'm not really sure how that sort of process works - this is the first time I've done anything like this before! I'm very surprised that a SNES to GameCube adapter has input lag... it really should have no reason to from an electronics point of view... even my N64 adapter doesn't have any input lag! Do you know which adapter specifically it is that has lag? I'm curious to investigate further. ElectroModder wrote: Thanks, I'm glad you like it! I think this was it. Thanks. From what I've heard, all the Raphnet adapters pretty high quality, and I'd be surprised if their SNES adapter had input lag, so I was assuming it was a different one. That's very strange.. I might have a look into that in future at some point. After get a fullset of Gamecube and NES, I'm preparing the forthcoming publication of a book about 3dfx and the history of 3D computer graphics. On November 25 I presented the book in Retrosevilla Expo 2018 (Seville, Spain) which will also launch a crowdfunding campaign on Kickstarter that will run until December 31st. I wait that you like it . Feel free to ask me if you have any questions. Hey good luck on this I'm actually kind of excited for it. So just out of curiosity are you writing the english version yourself or having it professionally translated and edited? Just wondering. Sorry for the delay to reply.